And yet, here I am again. In our modern, truncated world of social media and short attention spans, here I still am. I won't get into my disenfranchisement with social media... because I still put stuff out there, just not on "the big one." I prefer Instagram. It feeds Twitter. Twitter is visible here, on the right (look, look!). Yeah, follow that, instead. Far fewer words, far more pictures, far more subtext; which is sorta my style anyways. Subtext. Subtext on everything. The point I've learned from all of this writing for years and years is that perhaps the subtext should remain unspoken. I've spent a lot of time here trying to convey it, but it remains very intangible. It's a look between friends, the vague colors of a landscape at dawn, or the moments behind the perceived motion caused by lines blurred by too-long of a camera exposure. It's the long pauses, the spaces between the words, and the impulsive chortle of agreement that sneaks past your breath when something resonates. The sun may be setting on this little project of mine, if for no other reason than a complete and utter lack of available time. The sensations and subtext, however, are indeed available at least once per week on Instagram ... @rusadude. Just go do it ... (please, and thank you) ... and then go for a ride, for cripes-sake. THAT is where "it" happens ... not here. ...for now... here's a few that didn't make the feed (but likely should have and may still) from the last few randonneuring adventures. Yeah, it's a "streak" again... time to go for R-12 #6. Why not? From the June 2018 edition of the rare Aliceville Twister 200km permanent. It starts a bit out of town, but, for that very reason, offers a change of scenery and a chance to see the Flint Hills of Kansas - if only briefly. Starting in Garnett, KS., and heading generally west to Madison, KS., there are miles of sky and field to enjoy. Under clear skies, and really high humidity and eventually hot conditions, Terry B. and I had a really good time knocking out June - just in time. 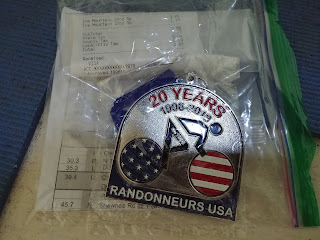 Taken with the 400km ride back on May 5th, this was #2 for this latest run at the annual R-12 goal. Here, the utility poles have disappeared and we're approaching the edge of a big ridge which drops into the valley containing Lamont and Madison. With the haze and heat, it looked like the entire west was opening up - like looking out over the ocean. Amazing, and something the camera simply cannot convey properly. Heading back east after the halfway, Terry B. dishes out the pace while we work toward the sanctuary of Colony, KS., which promises water, air conditioning, and a rest. 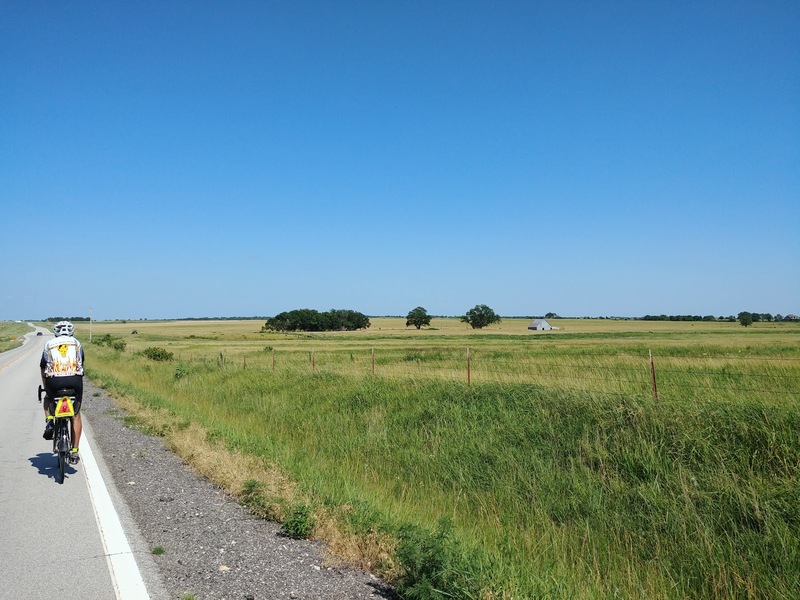 As you might see here, the route offers no shade - and at this point the temperature is well into the upper 90's, with a heat index far higher. Not pushing too hard, staying hydrated, and keeping a good mental outlook are critical. "It's only a few more miles," on repeat. 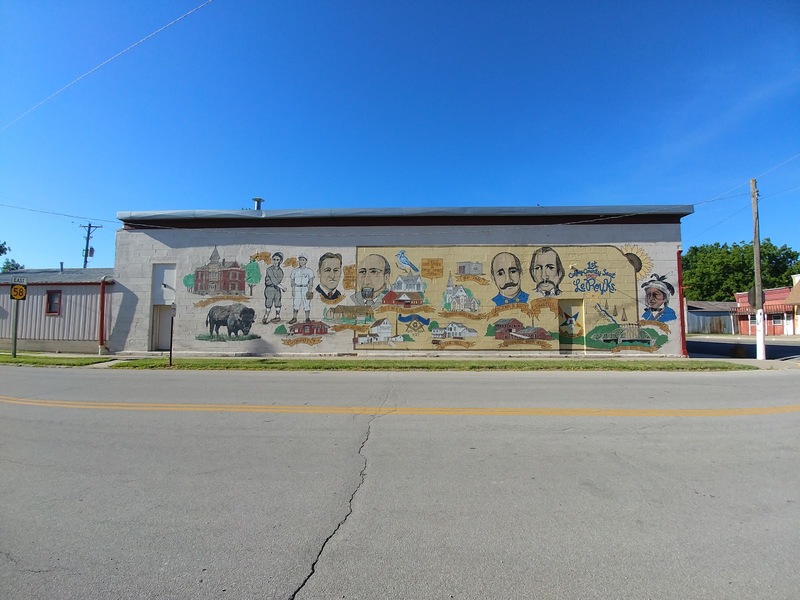 Part of the experience are the murals of artist Jim Stukey, which can be found in Le Roy and Gridley, KS. along the route. 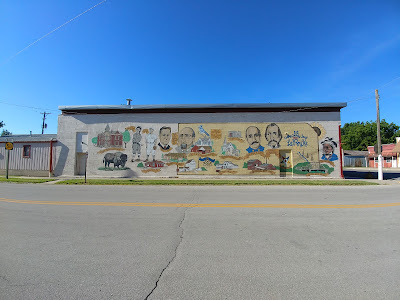 Sadly, the one in Gridley was on a building which was recently razed (unsure why), but this one (in Le Roy) survives. Again, the camera tries, but fails, to capture the breadth and emotion of this vista. 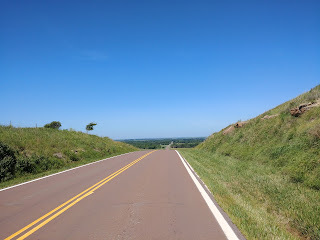 Heading west, the entirety of the valley opens up in front of you and invites you to find the opposite ridge. It's amazing... I struggled with including it here, but it really isn't a spoiler: the real thing is far, far more amazing... especially from the saddle of a bicycle. Similar to last year, yet this time not really wrapped up in a competition -- possibly, and rightfully, due to some backlash from the Strava-heavy nature of last year's National Bike Challenge and the practical motivation of the challenge compared to what it turned into -- I decided to try again on a solid, summer-long streak of commutes to work. After all, that's sorta what I'm supposed to be doing anyways; it's what I prefer. I don't like who I am when I drive, not really a fan of other drivers, and my personal and mental health are more important to me than saving a handful of minutes transporting myself to and from wherever I happen to go. So, there's a good streak happening there, also. Feels pretty good; you should try it! Another route I hadn't ridden in years, the Left of Centerville route includes a handful of cool, old bridges, a lot of railroad track parallels and crossings, and plenty of long, open stretches of road between towns. 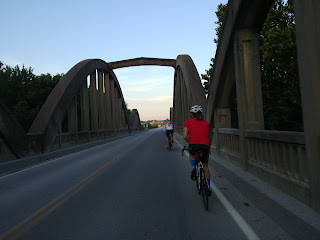 Once more creeping up on the last part of the month, Terry B., and (here, on the Potawatomie Creek Bridge on old K-7 (er, old US-169, also, I think)) along for the fun are Drew and Ryan, the Rando Bros. (tm); a couple of genuinely nice dudes, and strong, strong riders. The day was loaded with good tempo work and lots of great conversation. 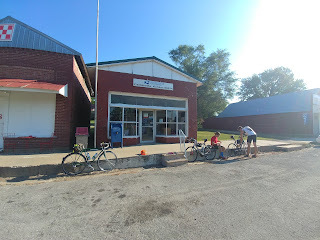 Due to a hilarious miscommunication, Terry B. was actually at least 15 minutes ahead of us here, as we take a break at Centerville, KS. We thought he was lagging behind at Parker - yet, he quietly managed to sneak past us there. Not a control, but low on water already - we had to stop at Parker - and Terry, ever the constant rolleur, just doesn't need to stop as much. Joke's on me... the rest of teh day would be spent trying to reel him back in. Not many cares, we hang out for a bit. And if we hadn't hung out in Centerville, we wouldn't have met "rando-cat." Later in the ride, an unexpected detour. 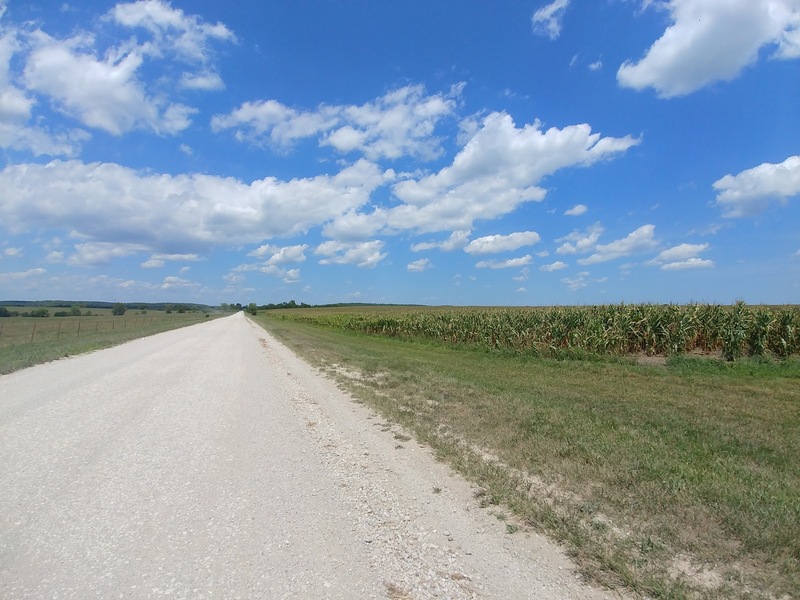 Sometimes the road construction web-pages are wrong, and the result creates a gravel detour of exceptional quality with outstanding scenery. We ended up with almost identical mileage to the official route, despite almost none of it being visible on a map. It was nice when a local happened by, otherwise we might have ended up with a long backtrack. Instead, we rode across a couple more interesting bridges, through an honest-to-goodness forest of some kind (the trees in one particular section, I swear, don't look like they belong in Missouri) and we saw some wildlife along the way. 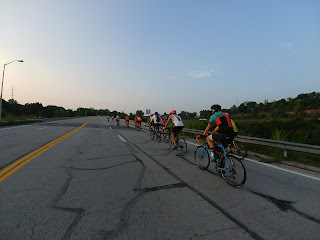 Adding to the fun of the July ride, I elected to ride to and from the ride start in Paola, adding about 50 miles to the day and capping off the month nicely. And I feel a little old... sometimes. I remember the 10th Anniversary RUSA ride back in 2008. I remember it being brutally, brutally hot. I remember it being a pretty good day, and I have the medal. This time, the 20th Anniversary RUSA ride, for 2018... yes... new faces, old faces; new bikes, old bikes... it was great! 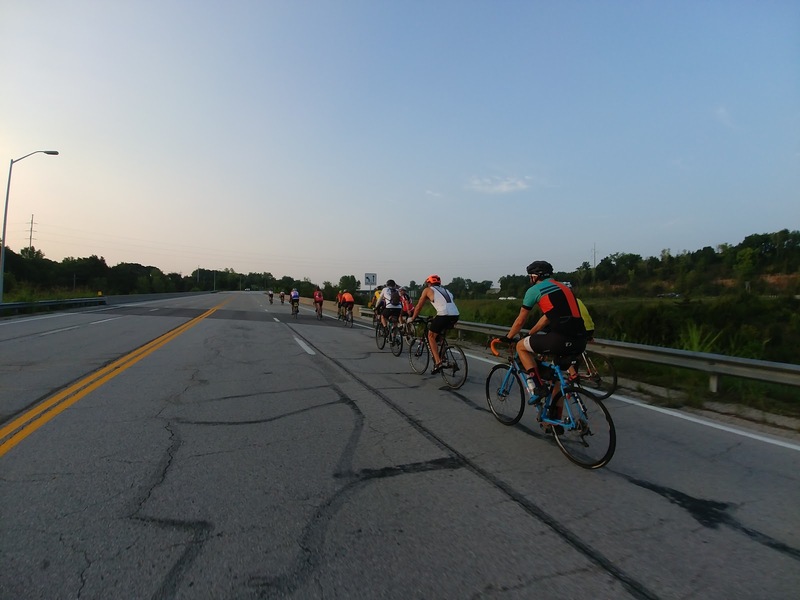 Mile One of the Princeton Roundabout route takes riders up and over I-435 on Renner Rd. and generally makes me question lots of things about myself ... like what I ate the night before, or a few minutes before, the start. It's not a brutal climb, traditionally-speaking, but it does continue for quite a while and provides a nice warm-up. If you are thinking of winter permanents to continue your streak, this is a good route for this reason -- if nothing else, you get right up to operating temperature in almost no time at all. Here, "everybody" gets down to business; Adam, Drew, Ryan, Karen, Greg, Terry, Paul, Jack, Ron, Carl, Dave, Steven, Gary.... gads, I'm losing track already. It was a great turnout! An honest-to-goodness Cannondale CAAD3 Saeco Team Edition, with actual Spinergy Rev-X wheels and Shimano Dura-Ace 7700. 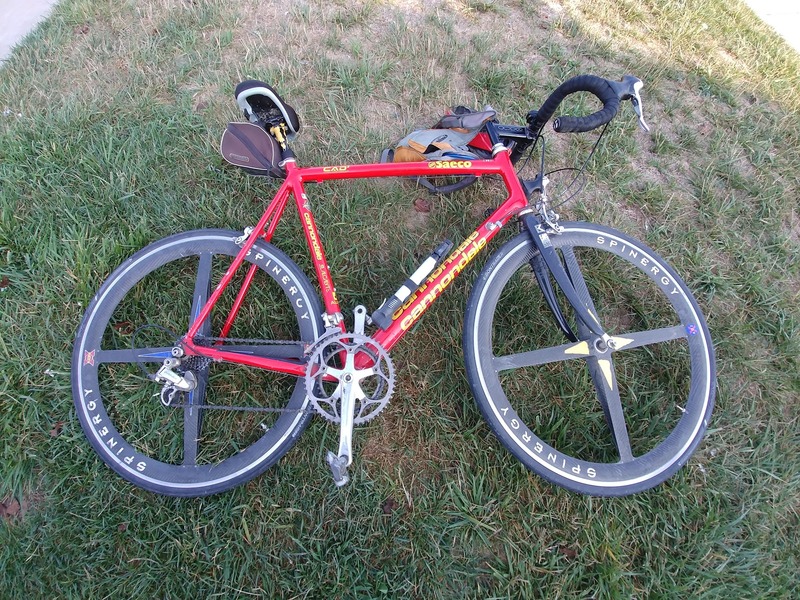 So much cutting-edge tech for it's day, and still a wicked awesome example of the bicycle racing arms race which continues today, being a fan of the exploits of Cippolini and the Saeco squadra, I wanted one of these - bad - back in the day. So cool to see one. Some great gear showed up in the parking lot for this ride, including a terrific Litespeed, the cutting edge of gravel-tech from Lauf, two stunning examples from Colnago, and the rest of our usual randonneuring squad's always interesting variations of "how we do this crazy stuff." Showing up early in the parking lot of ANY rando ride is a treat - plus, it's a big help to the organizers. 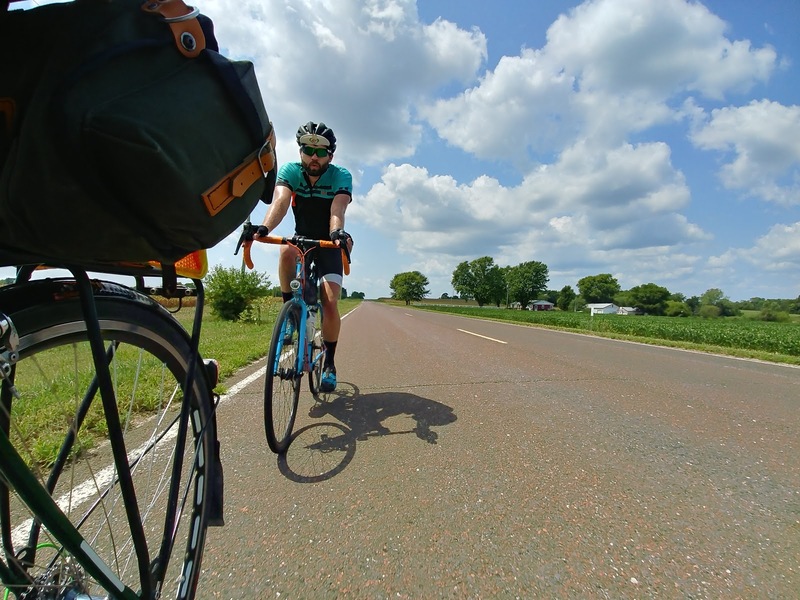 I'm happy the bag didn't get in the way... the under/aft shots seldom turn out; but, this time we get Adam resting after a pull along John Brown Highway, which runs east-to-west between Osawatomie and Princeton, KS. We had a decent day on this outing, and while we didn't break any records and certainly fell off the pace of the fast folks off the front, we demonstrated a terrific amount of consistency for what (for me, anyways) is normally a brilliant start, a shaky middle, and a death-slog ending. 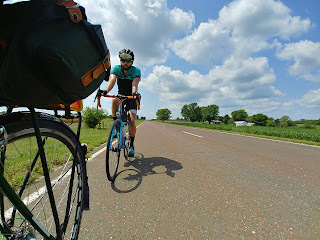 Instead, we actually managed to improve on our rolling average speed over the last half of the route - without any tailwind assistance. 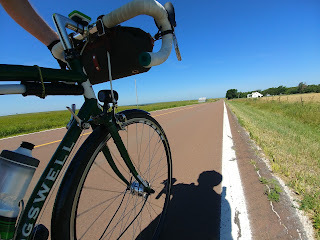 In fact, if anything, we had a slight headwind for the last 20 miles, but, we managed to finish quite well. That, honestly, feels really, really good. It means the dietary consistency I've been exercising has translated to better performances on the bike - which, along with obvious health benefits, was my goal. Let's keep it going! By the way, Adam is a strong rider ... I'm happy to be here. We're talking about a guy that RUNS 50km events, on trails, for fun. He's one of those good dudes that makes the miles easier; good vibes, good discussions, and solid attitude. 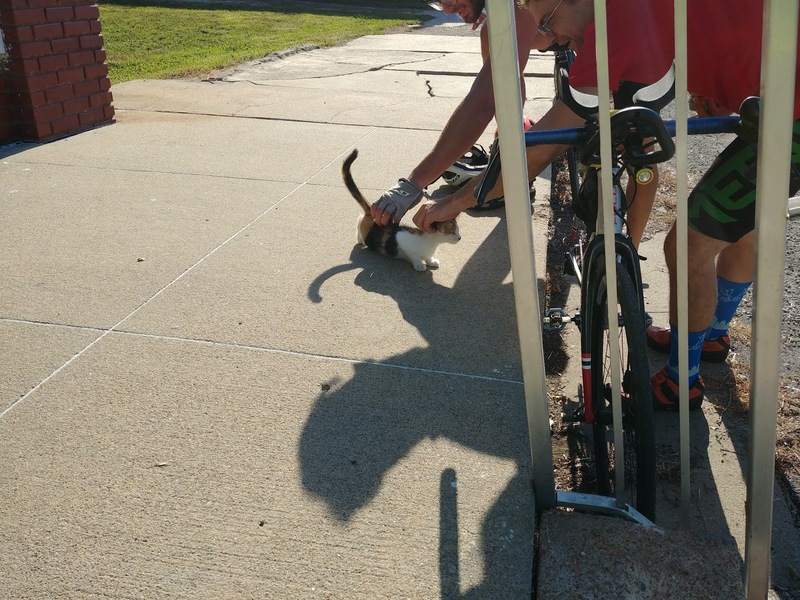 This sport is all about good people, and good, long rides. 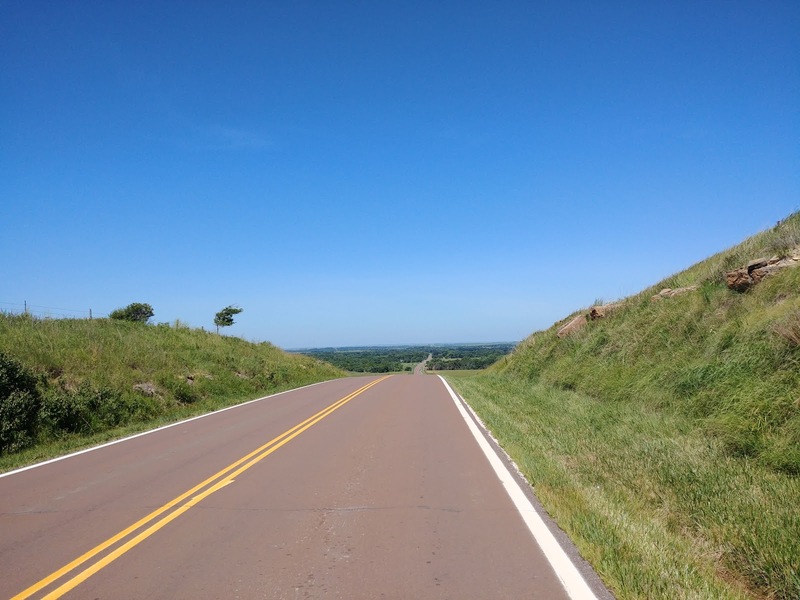 Perfection on the lonely roads of east-central Kansas. Happy Anniversary, RUSA! See you in 2028... or 2023... will there be a 25th Anniversary medal? Who knows ... let's just ride it. More to come, yes... but in smaller chunks like this. We have a good streak going... stay tuned! Oh, and seriously... look for me on Instagram for the rest of the story. Let's go ride.... allez, allez!